 Public Lab: Is this product applicable in real-time on a robot to identify dandelions? Question: Is this product applicable in real-time on a robot to identify dandelions? I would like this spectrometer to be on a ground vehicle to identify dandelions. I was wondering if this will be applicable outside, say in a backyard? 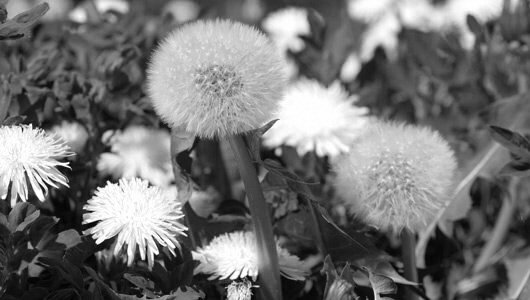 It would need the capability to identify a dandelion vs. a leaf and then a specified task would be performed. Please let me know if you require any extra information. I am currently a senior at Rutgers University. This is a capstone project for our senior mechanical engineering group. We are currently looking for an object that can accurately identify plants. Depending on your goal, a spectrometer might not be needed to locate dandelion flowers. They are dramatically distinct from green leaves in the visible spectrum, so a consumer camera might be all you need. It should be straightforward for an image analysis routine to determine which part of the image below is dandelion flower. A digital camera is a blunt spectrometer with three color channels, so using just one channel could make the routine even simpler. Below is the red channel of the photo above. 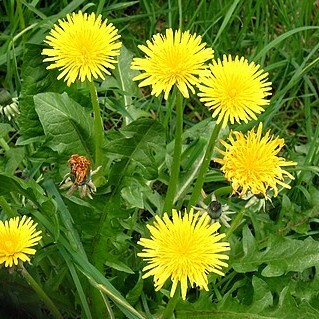 The red channel might also allow you to distinguish dandelion flowers from fruits. To do the best job of distinguishing yellow flowers from other things (like white flowers), all three channels can be used to identify yellow. Any webcam or Raspberry Pi camera could be used for the sensor. If the task your robot will do is to spray glyphosate on each plant, please reconsider. Thank you, we would also like to take it to applications where we would differentiate between two green plants. Would a spectrometer be able to do this? Many plant species have leaves with broadly similar spectral reflection properties. So depending on the species it might be a challenge to distinguish plant species by the color of the leaves. The difference among species will likely be smaller than the variability due to sun angle, leaf angle, surface moisture, leaf age, and leaf health. Leaf shape is a better taxonomic indicator, and there are not many plants with leaves shaped like dandelion leaves. But determining the leaf shape of an individual leaf in a lawn might be very hard if all you have is a digital image. That could be a challenging image analysis task. I don't know if it's helpful, but the folks in the #webvalley project used an exposure-controlled version of the DIY spectrometry kit to compare raspberries for ripeness, and were able to do very well-controlled comparisons, though under a very controlled light source.